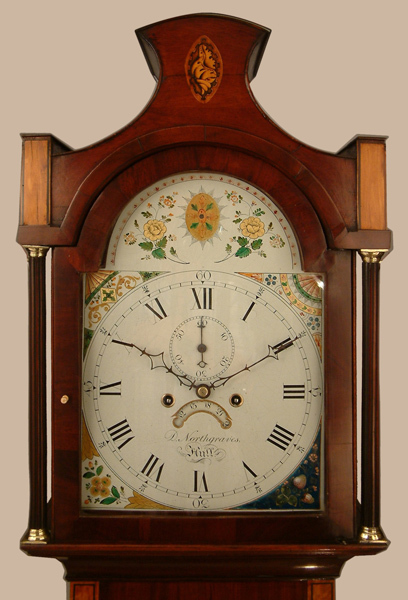 Denton Northgraves of Hull Longcase Mahogany Early 19 C. - Height 85.8in. This Longcase Mahogany's Maker - D. ( Denton ) Northgraves of Hull recorded at 32, Corner Silver St., 1790 - 1823. Typical late 18C/early 19C Sheraton style Hull area case with shell inlaid pagoda top, "Zulu shield" veneerwork to long trunk door, ebony strung satinwood details plus boxwood and ebony stringing. Brass capped reeded hood columns with matching trunk quarter columns.Exquisite cabinet work. 12" breakarch painted ( Walker and Hughes ) dial with "sad mouth" date aperture and subsidiary seconds dial. 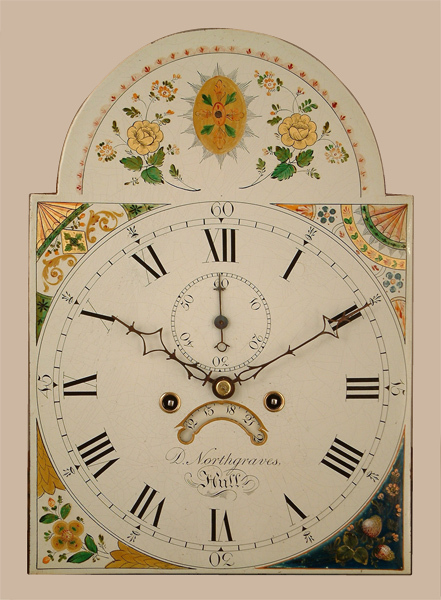 This dial is extraordinary in that the corner spandrels are decorated in 4 different styles possibly as a sample. N.B. Walker & Hughes are recorded 15, Lower Priory Birmingham 1812 - 26 and at Fisher St. 1827 - 35. Blued cut steel hands. Good quality 8 day, 4 pillar, hourly ( rack ) striking movement. D. ( Denton ) Northgraves of Hull recorded at 32, Corner Silver St., 1790 - 1823. 85.8" ( 218 cms. ).